Temporary, or "sticker" tattoos featuring imagery from many of the common themes in Dolly Kei. This is sort of a strange idea to me, but I will admit the images are very pretty and I would like to have a pack, if only to add to my dolly kei collection. 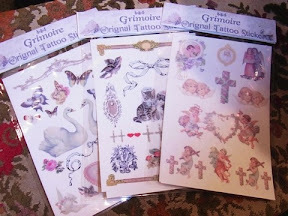 Grimoire is offering ten package designs, which you can see on their blog, along with photos of the shop staff wearing the tattoos in various ways. 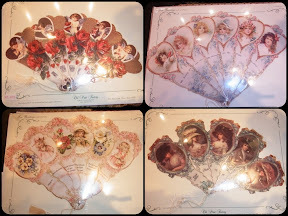 Grimoire also stocks these lovely paper fans from Old Print Factory! So pretty! So what are your thoughts on the tattoos? Weird or a great idea?